User Experience Management as a means of understanding and improving end-user interactions is growing exponentially. In a 2012 survey, 75% of respondents said UEM was becoming more important for their organization, compared to just 2% who said it was becoming less. Research has found a strong correlation between effective UEM deployments and growing IT budgets and increased C-level involvement. 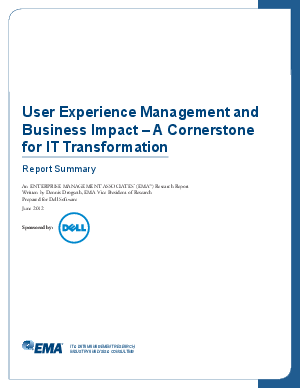 To see how UEM is becoming “the most effective transformer for better IT business alignment,” as well as what improved UEM can provide your organization, download User Experience Management and Business Impact – A Cornerstone for IT Transformation.